West Bay, Dorset - Places of Worship. St John's was built in 1936 to a design by Randall Blacking, an eminent church and cathedral architect and dedicated in 1939 by the Lord Bishop of Salisbury. In a free version of Gothic, the nave and chancel have south aisles with no structural division between them. The nave has a pointed barrel vault. The fine Reredos comprises five niches containing the Crucifix in the centre, flanked by figures of the Virgin Mary and St John the Evangelist. Carved figures of St Nicholas the Patron Saint of Sailors are at the northern end while at the other is St Osmund, a Norman Priest and Chaplain to William the Conqueror who became Bishop of Salisbury, where he died in 1099. The east window, consisting of five stained glass lights, also designed by Randall Blacking, was dedicated in 1959 to both his memory and that of Canon Farrer, a much loved Rector of Bridport for 21 years. Made by Christopher Webb, the main feature is 'Our Lord in Glory' and at the base are the words "They that go down to the sea in ships and occupy their business in great waters, these men see the works of the Lord and his wonders in the deep." The sailing ship at the bottom left corner is the Brigantine 'Mary Hounsell' built in the harbour in 1833, while the lighthouse is that of Portland Bill whose flashing light can be seen from West Bay. St John's features a permanent memorial of St Andrew's Church which on its closure in 1978 was one of the Churches of the Parish of Bridport. The stained glass window gives the impression of Christ walking on the water and rescuing St Peter. It overlooks the Alter of the Lady Chapel. 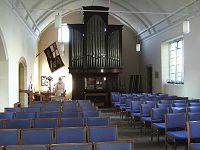 The church organ was purchased in 1972 from the one-time Methodist Church in South Street, Bridport (now the Arts Centre) and the splendid oaken case previously housed an organ in Bryanston School Chapel. The font was originally used in the 'Little Upper Room', previously a sail loft facing the Harbour and The Green. In 1862 it had been opened with much festivity as Bridport Harbour's own place of worship, first recorded as St Andrew's Mission Church. Later in 1897 it became more affectionately known as 'The Little Upper Room' and remained in use while its dedicated band of workers contemplated the construction of a new church. Today a dedicated congregation preserves the quiet charm of this sea-side place of worship. Regular Sunday Morning celebrations of Holy Communion are attended by a congregation of twenty plus - with several visitors, especially during holiday time. Reproduced from the St John's 'hand-out' leaflet. The Methodist Church on East Beach was opened in 1849. 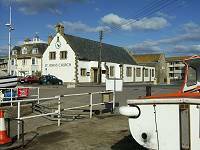 It nestles between Clarence House and the Bridport Arms and is sometimes referred to as 'The Chapel on the Beach'. John Wesley (1703-1791) started the Methodist religion due to his passionate approach to preaching and extreme opposition to slavery. In 1817 Dr Roberts, a well known Methodist preacher in Bridport, together with William Tutcher, began open air preaching on the quay at West Bay. They went aboard vessels in the harbour to take the Gospel to the crews and encouraged them to come to a local sail loft where the bible was read. Later this work was established under what was known as the 'Bethel Flag'. A local Wesleyan society was formed in 1828 and met in a house that belonged to Richard Warr. William Loveless was initially appointed as leader, but 2 years later this task was taken over by John Cox, the local shipbuilder. Ultimately the house became too small for the congregation and a decision was made to build a small chapel at a cost of about £200. Land was granted for this purpose by the Harbour Commissioners and the work was undertaken by Messrs. Cox & Son, Shipbuilders. In 1849 the Foundation Stone was laid by Mrs Cox and the Chapel was opened on the 4th December of that same year. Later, a Sunday School was started. During the Second World War of 1939-1945 the Chapel closed, suffering damage due to military exercises that took place at West Bay in preparation for the 'D Day' landings in France by Allied Forces. 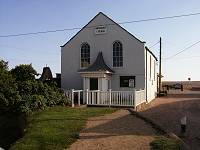 The 'Chapel on the Beach' re-opened on Easter Day (6th April) 1947 under the leadership of the Reverend C. O. Hunwick at the request of the Methodists and members of other Free Churches. 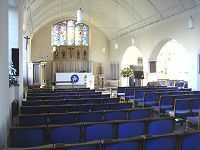 Due to a diminishing congregation, the chapel finally closed in May 2007. Produced with reference to the West Bay Women's Institute history files. More chocolate wedding cake? Oh dear my girth!